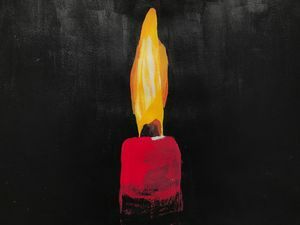 Black background, it has a short red candlestick, but the flame is like twice it’s length. The bottom of the candlestick has no solid ending, but more like it fades into the background. There is also a little bit of shadow on the right side of the candlestick. The flame is long and bright yellow, streaks of white can be seen in the center and it projects a little bit of an orange light. The wick is also visible and is mostly brown.